This red geometric piece is on top of a steep slope. Until the plants grow in, this playful bright pattern reminds one to watch their step. When the plants do come in, it will be a nice contrast to the green foliage. Thanks Bunny! These were sold at the Yard, Garden & Patio show, a low fence and some fiddlehead ferns. These fiddleheads were placed where the future ones would be planted. 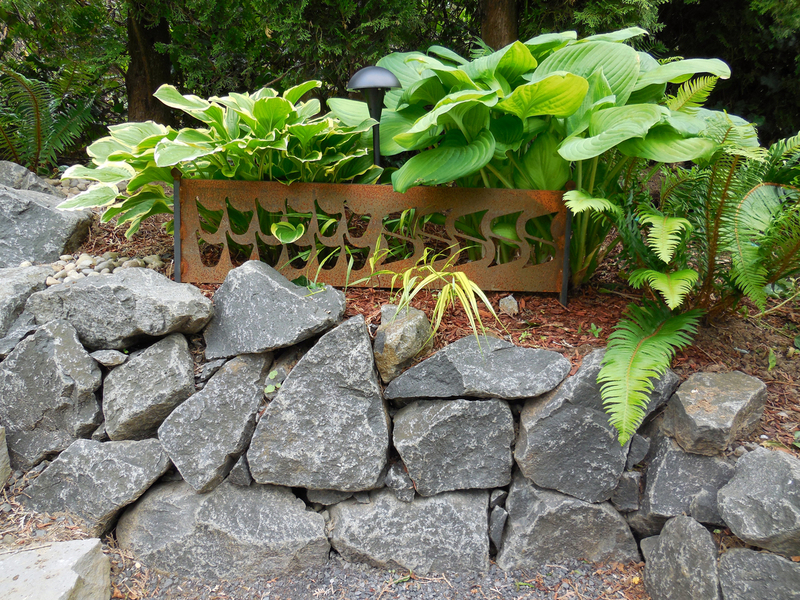 In the after photo the hostas really pop next to the laser cut steel. Thanks Bunny, for the pictures! Categories: client photos of work | Tags: industrial remnants, scrap steel | Permalink.